Here I am talking about a different type of moonwalking, whilst the moonwalking maestro has shuffled off this mortal coil. 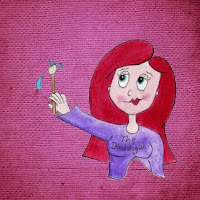 Anyhow back to talking about me, me and some more about me. I arrived in Edinburgh on Friday afternoon and headed up to the hostel I was staying in during my visit. The Castle Rock Hostel was literally across the road from Edinburgh Castle and a hop, skip and jump away from the Royal Mile. It was an ideal location to base myself for the weekend. As I was on my own I arranged to meet up some of the others that were doing the MoonWalk on their lonesome for a bite to eat. It was nice being on my own, but also good to meet up and have some company too. Too be honest the last few weeks had been so stressful that it was a miracle I even made it to Edinburgh, let alone plan anything. I was still absolutely crapping myself at the thought of the impending 26.2 miles of hell that I had voluntarily signed up for, but for the time being forgot about that and enjoyed good food and company. Saturday arrived after a disturbed night of sleep, mainly thanks to chatty drunk Irish girls sharing my room, they were fun though. After a lazy morning I met up with one of the girls from the night before (Debs) and we had a lovely lazy lunch. Then it was back to my room to rest and prepare for long long night ahead! Still not believing what I was getting myself into. Around 8pm it was time to head to the Pink City in Inverleith Park, Edinburgh and meet up with some of the girls from the walk the walk forum for food and a chat before walk time. 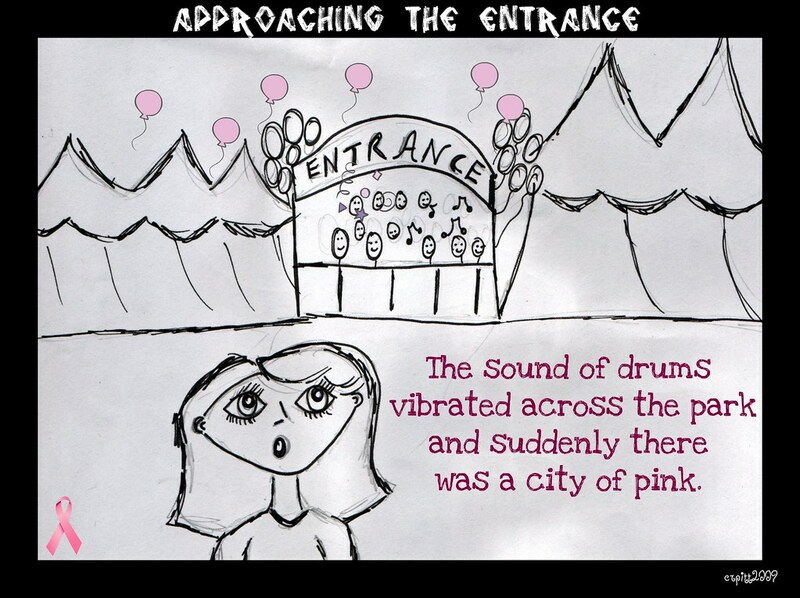 As I walked through the park entrance I could hear drums and then a huge pink city arose before me. 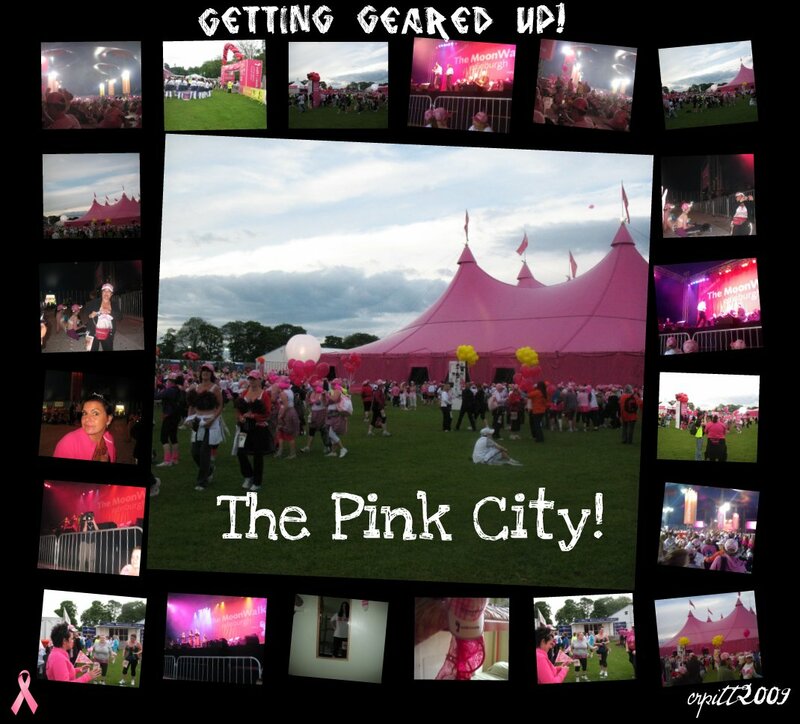 The atmosphere is absolutely amazing as you walk through the entrance, surrounded by a haze of pinkness. Panic began to kick in as everyone was excitedly talking about the walk and all the training they had done. I didn't think now was the time to confess that the most I had walked was 8 miles of late and that I was going to be sick! So as everyone got more and more excited, I got scared! In the great big pink city we gathered for pasta, talks from the sponsors and then the dreaded warm up. I can't grapevine to save my life, my brain says left, my leg goes right! so I shuffled further and further away from the warm up zone and felt lost in the crowd. At this point, more than any other, I felt very alone and sorry myself. I was in the Pink group, so that was the last group to be called to the gate and the excitement was all around as we were herded to the gate ready for the off. The Pink group was about 30-40 minutes behind the lead group and it was slow going through the gate. Shuffle, shuffle, shuffle and then I was free from the crowd, well a bit free anyways. Whoops, claps and cheers abound, so much so that you couldn't help but feel part of something special. I think that atmosphere carries you through the first few miles, as you look around the beautiful city of Edinburgh, absorb the excited chatter and forget your worries. It is when things get quiet and the atmosphere becomes more serious as people get their heads down and pick up the pace. The pace! Bloody hell! It is nothing like the pace of hiking or normal walking. Upping the gear from 2.5 miles an hour to 3.5/4 miles an hour is a serious wake up call to your muscles (or lack of them). I thought I was a good judge of distance, but holy moly were those mile markers slow in coming! I nearly cried when it felt like an age to just pass 3 miles. I didn't even want to update anyone via my phone as I was in serious doubt of finishing even half way. At mile marker 11 the half moon walkers branch off and do their last two miles to complete the 13 miles of their challenge. How I wanted to go with them! 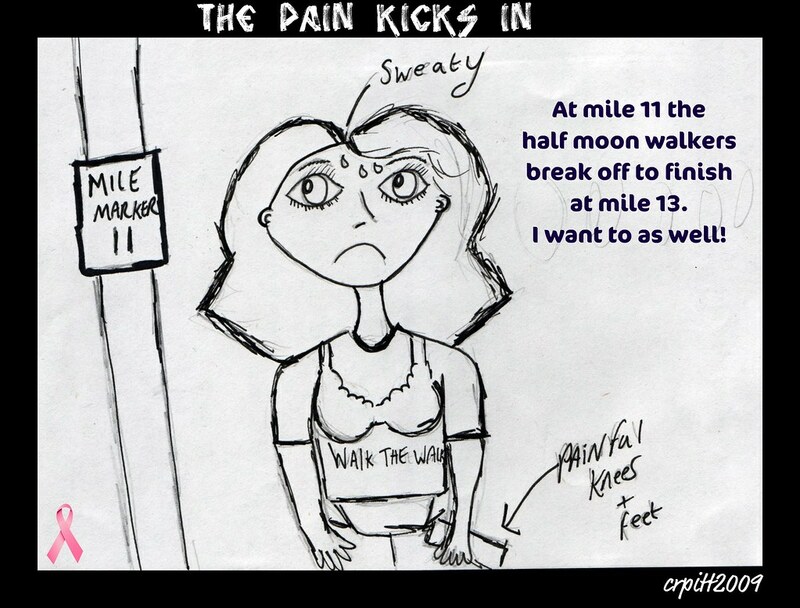 Especially as it dawned on me painfully and slowly that I wasn't even halfway <--------------- Insert whingeing here! Just past Mile marker 11 it was toilet stop time and although it was freezing and the queues were massive, I needed to stop. During the queue I gave myself a pep talk, sprayed my knees with half a can of freeze spray and popped some pain killers. The combination of pep talk, text off the mumborg, painkillers and freeze spray did the trick and I began to pick up the pace. After reaching mile marker 13 and the disco bus, I plugged myself into my mp3 player, turned up the volume to ear bleeding level and kicked myself up the arse. What a wonderful descriptive and detailed write up. I almost feel like I was there cheering you on. I'm hanging in by my fingernails waiting for the next installment. I would say that I feel like I was there, but I'm so glad I wasn't! You are a brave woman, Claire! I walked home from work today which was only a little over a mile and have a very nice blister on my right heel to show for it along with a lot of achy bones! I'd have never made it past Mile Marker 3 I think! 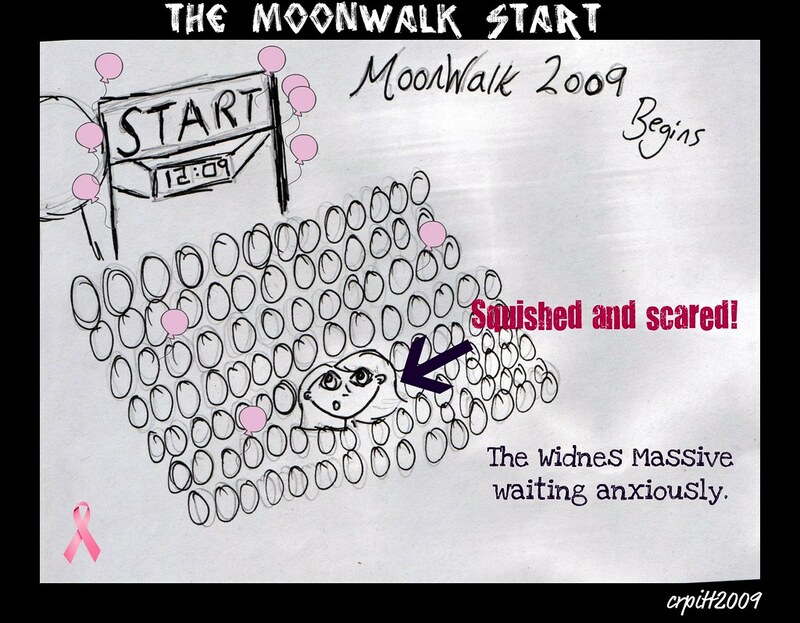 interesting - because of your post I search around and found some news stories about the moonwalk. There some pictures up at the BBC and other sites. Did you have any pictures of yourself at the event? I am hoping we are not having to wait for Part 2 because you are still wandering aimlessly around Edinburgh with a can of freeze spay?? I went shopping today and barely made it back to my car! I can't imagine such a trek! Once again, you did a fantastic job with the prose. I'm so glad you've decided to stay with us here. Don't know what I'd do without my "Brit fix!" 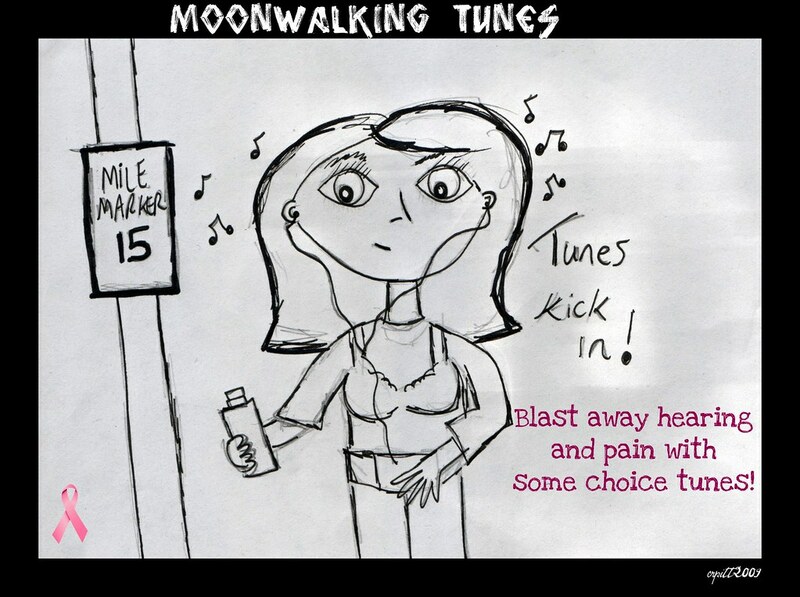 Just swinging by to put some pressure on you, since I'm loking forwards to read about the rest of your moonwalking adventures! And while I'm here, I might as well say, CONGRATS, and well done!